Wanting to create that WOW Factor at your next event but not too sure how? We have exactly what you are looking for with our Themed Catering Feasting Stations. Flavours Catering & Events Themed Catering Stations will have your guest amazed and offer an interactive experience like no other. We have designed 12 individual Feasting Stations to suit different themes and offer a broad range of menu options from around the world. Our themed stations range from a Mexican Inspired Fiesta, Asian Street Market, Build Your Own Burger Bar, and of course something for the sweet tooth in our Envy of All Stations, and that is just to name a few. We can also customise a station to suit your individual event. Our event managers can work closely with you to make your idea a reality and something you can really be proud of. Our menu options are endless and can be customised to suit your taste buds. Select from our wide range of canapés to create the perfect menu for your Feasting Station. It doesn’t stop there, Flavours Catering & Events also offer a range of Themed Beverage Stations to provide your guest with an all over visual experience. Our Traditional Lemonade Stand or Bloody Mary Cocktail Bar are sure to quench thirsts and became the talking point of your event. Most of our Themed Catering Stations are available as delivered, set up ready to serve. However, if you are looking for something just a little bit special, hire a chef and wait for staff to provide the ultimate service for you and your guest. 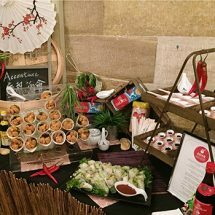 The next time you are looking for something a little bit different and a real crowd pleaser consider one of Flavours Catering & Events Feasting Stations. With these fun, vibrant and interactive concepts your event is sure to be a success.